The next generation of sweeteners is already joining the market, their development driven by the global rise of obesity, diabetes, heart disease and other health concerns as well as goals to reach new heights in taste and performance. Plus, the new Nutrition Facts panel, even though delayed till 2020, will start highlighting the role of "added sugars" in food and beverage products. Global ingredient supplier Ingredion performed its own research that found 61 percent of consumers said "added sugar" on a nutrition label would negatively impact their purchase intent. Aspartame, acesulfame potassium, sucralose and saccharin have been the most popular non-nutritive sweeteners for decades, although consumer trends for natural ingredients have heralded the arrivals of stevia and monk fruit. Stevia has made some significant inroads, while monk fruit is still looking to get traction. In the second quarter of 2017, the number of beverage and food products launched containing stevia increased 13 percent compared to the same period of 2016, according to Mintel Group data cited by stevia supplier PureCircle Ltd. The companies launching these new products with stevia, according to Mintel, include Coca-Cola Co., Danone, Kraft Heinz, Nestle, PepsiCo and Unilever. When stevia first arrived on the scene – it was approved by the FDA for use in December 2008 – it was processed largely as it had been for centuries elsewhere in the world: with water extracting the sweetness from the stevia leaves, much like brewing tea. Chemical extraction, more efficient but less natural, followed. All efforts were on the most abundant sweetening component, rebaudioside-A. While it was powerfully sweet and natural, reb-A did have a bitter or metallic aftertaste, which stymied stevia's penetration into many applications. But among further refinements of reb-A, the addition of taste modifiers or the blending with other sweeteners, even sugar, stevia eventually achieved significant penetration. Recent stevia developments have focused on organic versions of the sweetener, its creation by fermentation and the development of other rebaudiosides, primarily reb-D and reb-M, which are found in much smaller quantities in the stevia plant and are more difficult to extract but which don't have the aftertaste of reb-A. At June's IFT Meeting & Expo, Cargill unveiled a collaboration with Evolva for the production and commercialization of reb-M and reb-D, which will be produced by fermentation at Cargill’s Blair, Neb., facility. The resulting product line, EverSweet, is expected to launch in 2018. PureCircle delved deeply into the other rebaudiosides, particularly D and M, beginning in 2013. The company now has 14 different stevia sweeteners and flavors across its portfolio. Not everyone is convinced those "new" rebaudiosides are the holy grails "Reb-D and M are exciting developments, but currently they remain cost prohibitive and most are produced via fermentation, so there are some questions as to how the products can be labeled," says Phillip Coggins, director of commercial sales for Pyure Brands LLC (pyureorganic.com), Naples. Fla. "Pyure has developed reb-A-based products that contain smaller amounts of leaf extracted reb-D and M, making them viable and affordable. Pyure currently offers several unique glycoside blends, including Pyure Trio (reb A,C,D) and Pyure Prime (reb A, M). These are proprietary blends that are truly unique within the space. "Organic and non-GMO remains the key focus at Pyure, so leaf extraction and avoiding enzymes or fermentation is important," Coggins continues. "In the future, there may be a way to produce organic and non-GMO reb-D and M (or other items that don’t exist yet), and Pyure continues to explore all opportunities." Even as stevia and monk fruit work to gain traction, there are some novel newcomers rising up to challenge them. One such sweetener is lucuma fruit powder, derived from the fiber-rich, subtropical fruit of the pouteria lucuma tree native to Peru, Chile and Ecuador. Lucuma has a subtle maple-like flavor that can help with sugar reduction or mask the aftertaste of stevia. BI Nutraceuticals (www.botanicals.com) offers the powder, as well as a water-soluble powder extract suitable for use in beverages. Lucuma also is offered by Alquimia USA (www.alquimia-usa.com), Concord, Calif. At the recent Supply Side West trade show, the company showed a handful of natural sweeteners, including coconut sugar and yacon, a root that yields a powder about half as sweet as sugar, according to CEO Tamara Pfeiffer. Monatin, commonly known as arruva, is a naturally occurring, high-intensity sweetener isolated from the root of a shrub, Sclerochiton ilicifolius, found in the Transvaal region of South Africa. 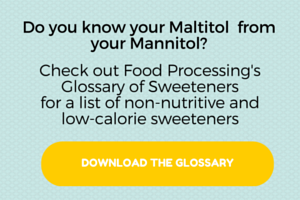 Monatin contains no carbohydrates or sugar, but is a whopping 3,000 times sweeter, and has nearly no food energy, unlike sucrose and other nutritive sweeteners. It's said to have a superior taste to stevia and monkfruit, with a profile much closer to sugar, and its proponents claim it has no aftertaste. The bad news? Though it's luring tests by food scientists, monatin isn't yet commercially feasible to cultivate, extract and separate out the RR-monatin molecule. Some forms of production are reportedly being explored by a few ingredient companies. Cargill began studying monatin back in 2012, but a company spokesman couldn't confirm if the company is still working on it. When calories are not as important as "naturalness" and novelty, there are new sources of "sugar" vying for attention and proving that sugar needn't come from sugar cane or beets (nor high-fructose corn syrup). Agave made a run a few years back but it never caught on in a big way. Its higher sweetness intensity (about 1.5 times sugar) helped balance its higher calories (about 60 per tablespoon, compared to 40 calories for table sugar). As both a tabletop sweetener and an ingredient, agave retains some faithful fans, just not many. Coconut sugar, mentioned earlier, is made from the sap of the coconut palm tree, not the coconuts. Proponents claim it's less refined, has a lower glycemic index and contains trace amounts of zinc, iron, calcium and potassium – but only trace amounts. Most versions contain indigestible plant fiber inulin, which slows the delivery of glucose to the bloodstream and is a prebiotic. Coconut sugar also may be more sustainable than sugar cane (yielding 50 percent more sugar per acre than sugar cane), which means less land use, less water and less taxing on the soil. But coconut sugar is still sugar, with a higher percentage of fructose than sucrose, which alarms some consumers. And it does contribute some taste, although most find it pleasantly earthy. Despite its name, Steviva Ingredients (www.stevivaingredients.com) markets more than stevia; coconut sugar is one example. Its CocoSweet+ is coconut sugar paired with stevia. "The optimum blend of these two natural sweeteners delivers a full, clean flavor profile with hints of honey or caramel and a mouthfeel comparable to sugar," the company says. "Participation in the Maillard reaction contributes to browning in baked goods." How about sweet potatoes? Carolina Innovative Food Ingredients (cifingredients.com) offers Carolina Sweet, a 75-brix, non-GMO, clean-label replacement for sugar, high-fructose corn syrup and fruit-based sugars. In addition to sweetness, it adds vegetable servings, flavor and color sweetness, as well as a health halo. Certified organic versions are available. Most consumers perceive a sweet potato-derived sugar to be a healthier way to sweeten, says the company. Also at this summer's IFT expo, ADM launched Fruit Up, a fruit syrup-based sweetener, in North America. Produced by a purely physical extraction process from various fruits without the use of enzymes or chemical additives, Fruit Up has a sweet taste and neutral flavor, enabling product developers to sweeten a variety of food and beverage products, reduce added sugar and round out overall flavor and mouthfeel. It also can help craft desired texture attributes in frozen desserts. Fruit UP is low-glycemic and non-GMO, so is a suitable solution for clean-label foods and drinks. Then there are "rare sugars." Wikipedia defines them as sugars that occur in very small quantities in nature, too small to allow for economic separation from their underlying natural source. So most commercial versions are made through biological processes such as fermentation or enzyme conversion to create the identical compound. Examples are allulose, allose and melezitose. Allulose even has its own website: allulose.org. The sweetener exists in very small quantities in foods such as figs, raisins, molasses and maple syrup and contributes fewer calories than sucrose. Allulose is being developed by both Tate & Lyle and Matsutani. Tate & Lyle introduced its original Dolcia Prima Allulose Syrup in early 2015, and early this year added a crystalline version. The new form "opens up new categories and applications, such as tabletop sweeteners, dry beverage and meal replacement mixes, fat-based creams and chocolate confectioner," the company says. Dolcia Prima allulose is approved for use and is available in the U.S., Mexico, Colombia and Chile. Matsutani Chemical Industry in Japan is marketing an allulose under the name Astraea (astraea-allulose.com). About one-third as sweet as sucrose, Versasweet low-sugar glucose syrups were introduced in October in the U.S. and Canada by Ingredion (www.ingredion.com). The ingredient enables manufacturers of confectionery, dairy and baked goods to reduce grams of sugar on Nutrition Facts panels. Formulating with the new corn- or tapioca-based glucose syrups can reduce the percentage of mono- and disaccharides (DP1 and DP2) by 50 percent or more compared to standard glucose syrups, depending on the glucose syrup being replaced. "The challenge for food manufacturers has been to reformulate a lower sugar product with minimal or no changes to the ingredient declaration list or existing processes," explains Nate Yates, director of the Sweetness Springboard-North America at Ingredion. Low viscosity, non-GMO corn and tapioca options of the syrup are available. If you can't beat sugar, better the sugar – that might be the rallying cry for at least one new and improved sugar. Nucane is a patented, low glycemic index sugar cane from Singapore's Nutrition Innovation (www.nutritioninnovationgroup.com), a global food science startup. Nucane is "100 percent natural cane sugar, direct from food grade sugar mills … which has been certified as low-GI [glycemic index] to World Health Organization Standards." How? The company has developed "a patented technology and algorithm to retain naturally occurring minerals such as calcium, magnesium, potassium in the production of cane sugar." The company claims it can quickly and easily convert existing sugar mills with new technology. "The underlying technology infrastructure required for this approach is provided by global experts in smart food technology, Foss and Schneider," says CEO Matthew Godfrey. The low capital expenditure gives the sugar mill or refinery the flexibility to produce Nutrition Innovation's Nucane or their normal commercial product at industrial scale as a one-for-one replacement for white refined sugar, he adds. Sunshine Sugar in Australia will be the first in the world to install the technology to produce Nucane, expected to hit the market in the first quarter of 2018.